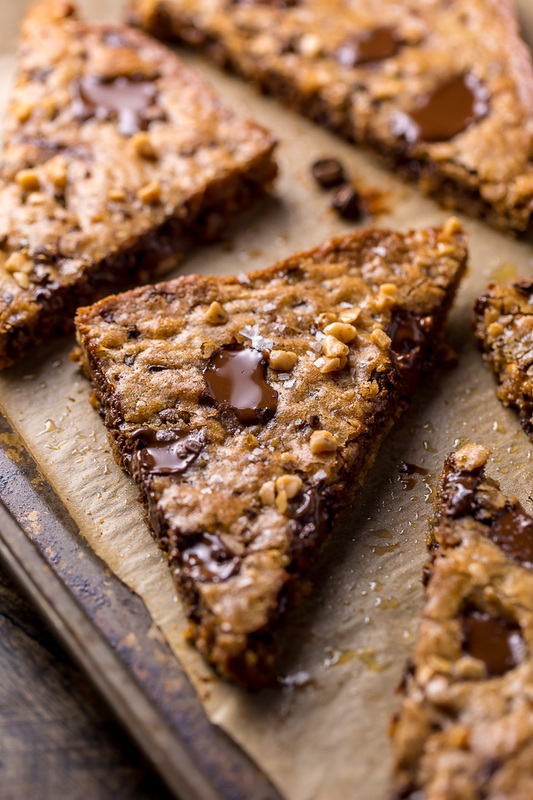 These thick and chewy brown butter espresso toffee blondies are made in one bowl! So easy and SO delicious! 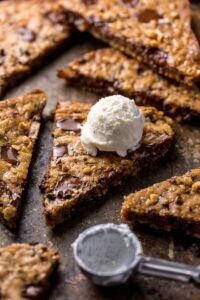 The base of these blondies is made up of the usual suspects: melted butter (in this case, browned butter), brown sugar, an egg, vanilla extract, baking powder, a pinch of cinnamon, and flour. Because browning the butter is the first step in this recipe, we’ll start there. And if you’ve never done this before, don’t worry; it’s an extremely simple step. You’ll need a small pan, a stick of butter, and a touch of patience – that’s it! You’ll start off melting the butter in a skillet. Once the butter has completely melted, you’ll continue to cook the butter, on medium heat (or medium-low if your stove top runs hot), until it’s turned a golden brown and smells slightly nutty. Just be sure you stay stove side once the butter has melted, as browned butter can turn into burnt butter very fast. 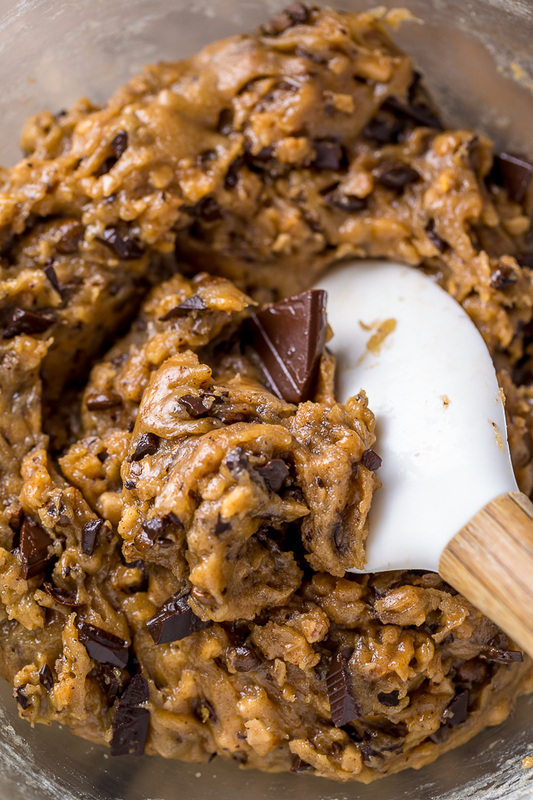 The three special ingredients in this recipe are toffee bits, chocolate chunks, and espresso beans! You could also use chocolate covered espresso beans, but I know they can be quite expensive and hard to find, so I wanted to give you options. Chopping up the espresso beans by hand can be a bit of a fiasco – they roll around like crazy – so if you have a food processor, use it for that step! Just a few pulses will do the job. 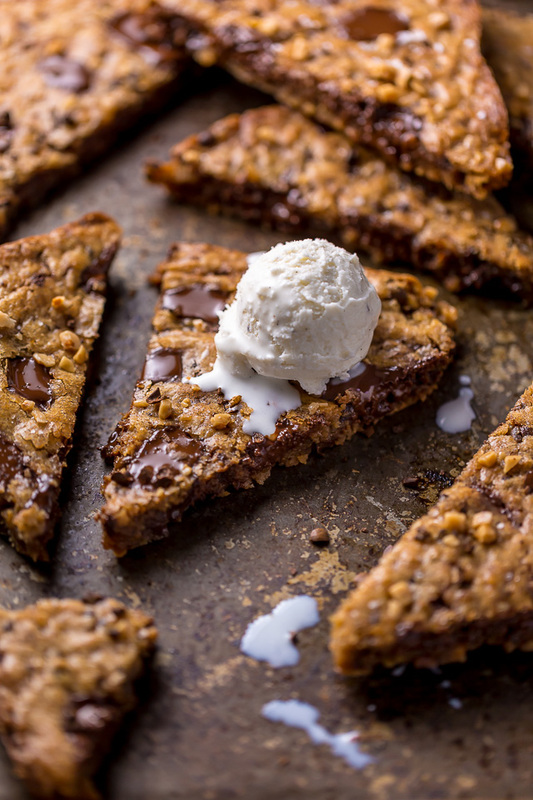 You’re going to need an 8-inch square baking pan for this recipe. 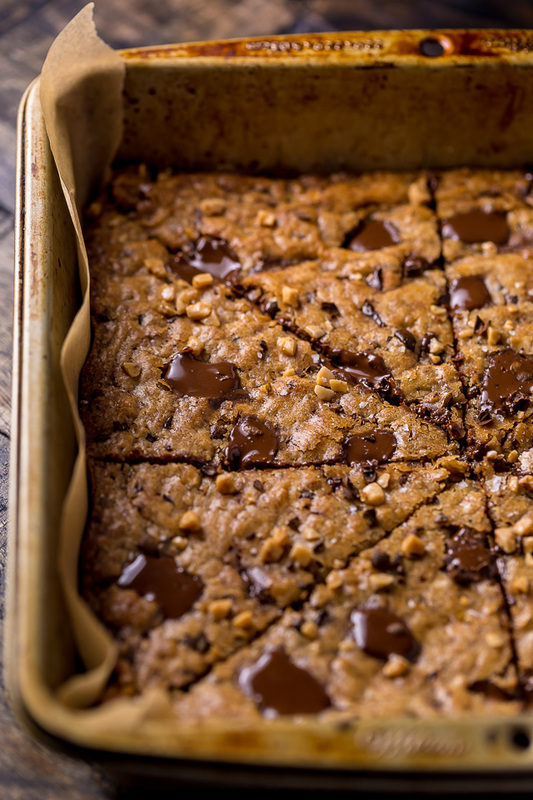 If you don’t own one, a load pan could work, but know the blondies will be much thicker and not as uniform. I don’t suggest using a 9×13 inch pan unless you’re going to double the recipe. Finally – and I know I’m like a broken record with this but… – my biggest piece of advice when it comes to this recipe is be sure you don’t over bake your blondies! When you pull them from the oven, they might look a little jiggly in the center. This is a good thing! They firm up a great deal during the cooling process. In my oven they’re done at exactly 20 minutes, but every oven runs a little differently, so keep an eye on them. 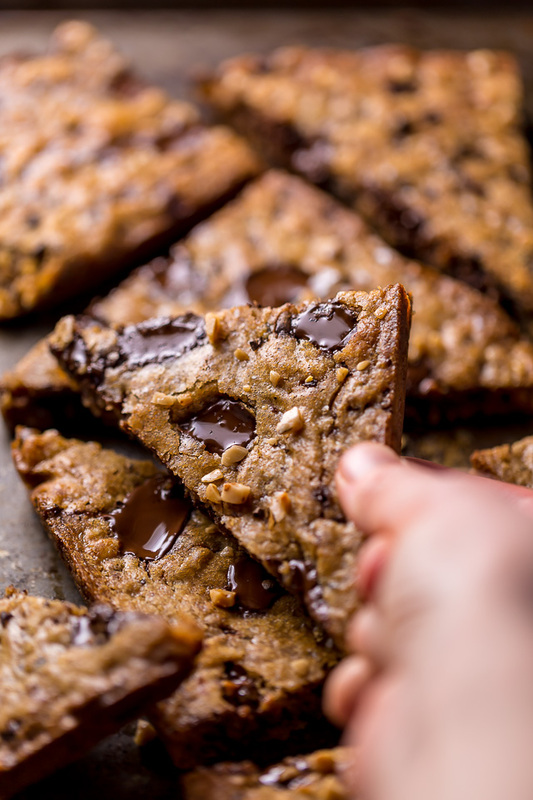 Thick and chewy brown butter blondies loaded with toffee and chocolate covered espresso beans! Preheat oven to 350 degrees (F). Line an 8x8 baking pan with parchment paper and spray parchment lightly with non-stick spray, set aside. Melt butter in a medium-sized skillet over medium heat. Continue cooking butter, stirring frequently, until it's a light amber color and smells slightly nutty. Remove from heat at once and cool for a few minutes before whisking in the brown sugar; beat until well combined. Add in the egg, beating until combined. Gently stir in the flour and cinnamon, and salt, being sure not to over mix. Fold in the toffee bits, espresso beans and chocolate. Bake for 20 minutes, or until the edges are firm and golden and the center is just slightly wobbly. Cool in pan for at least 15 minutes before cutting. Mmm these look delicious, what great flavour combination you have used. Can’t wait to try them. Man, do I love eating my morning coffee. Especially when it’s covered in chocolate. 🙂 These look so tasty! Hahaha yesssss!!! Thank you, Karly! You’re very welcome! I hope you enjoy them, Keith. ohhh I LOVE how you put chopped up espresso beans in there – flavour + texture in one hit. 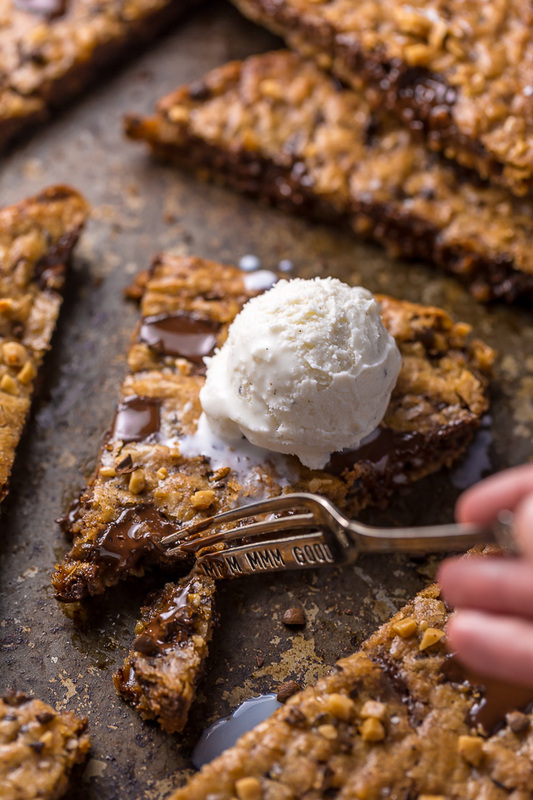 And it just looks SO gooey and amazing – I think really I need to branch out from the standard chocolate chip cookies into blondie territory. 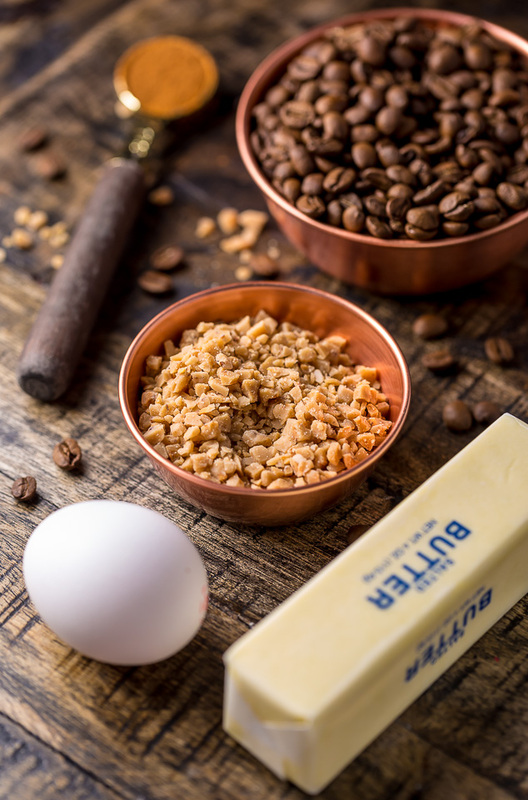 Can you share how do you make the chocolate covered espresso beans? I’ve scrolled through but couldn’t find it. Thank you. Hi Dilla! The espresso beans are from Trader Joe’s 😉 Although I really should try making my own one day! Can we substitute espresso powder instead? If so, how much should we put? Thanks! Can espresso beans be substituted with coffee beans? Wow this sounds incredible! So many delicious flavors! Wow these were good! Made these today with chocolate covered espresso beans. Such an easy recipe, so fast. They turned out perfect. Thank you for the recipe! Are these coffee beans roasted or not? How do we cut it into parts? The amount of half a cup in the recipe does not give that bitterness? Hey, can I replace egg in this recipe? If yes, how do I replace it? We don’t have an egg replacement for this recipe, but if you find one that works for you, we’d love to hear!